Here I have a huge selection of my art/sketches/illustrations available as custom stickers! Some completely exclusive and not found anywhere else - I have a lot more available designs than pictured. You will either receive a random selection of 10 stickers or 5. The stickers vary in size but the largest ones are around 4x4". I've always been fond of using stickers to spruce up letters or even to hide scratches on the front of a shelf. Here I couldn't resist the lovely drawings and the obvious surprise factor always lures me in anyway. 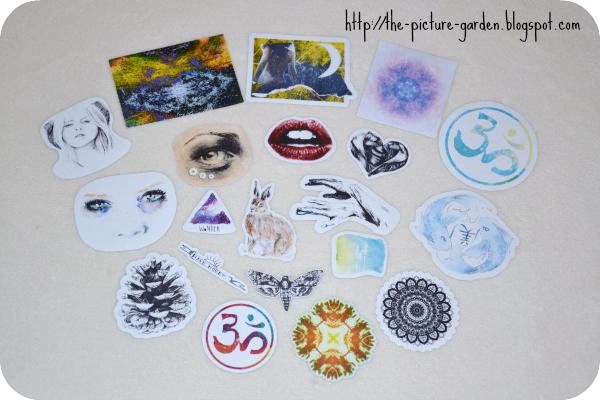 I am really pleased with the variety of stickers in my two grab bags, coming in all different shapes and sizes, with designs that range from cute to enchanting, making it a great way of discovering the artist behind them. Not just perfect for personalizing cards, some will be used in my plans to dabble with journaling too. A lucky glue-tastic dip! Are stickers something you generally like to use? If so, what are your preferred places to put them on? And would you agree that they lend a nice touch on cards or in DIY projects? Another thing we have in common ... I had a huge sticker collection as a child/teenager and I put them everywhere. My bedroom door was literally covered with them. Later on I rather collected them than used them. Today I might not own that many, but I don't leave them in a drawer either. It'd be a shame not to use/share them!